Throw pillows can make a plain room come alive with texture and color and this ruffled pillow made from a t-shirt is no exception. 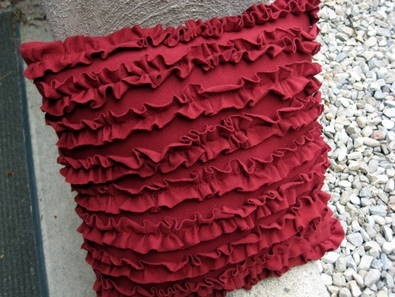 Recycle old t-shirts and make them into beautiful pillows using this ruffled pillow pattern. It only cost pennies to sew an attractive pillow when using the fabric of a shirt no longer being worn. It so easy you will want to make several for your family room, bedroom or den. This pattern has 11 steps each with an illustrative picture for sewing an awesome throw pillow. Add to the decor of your home by making lovely throw pillows out of t-shirts.